Lombard rugs - Deep in pile and full of colour, this high quality hand-carved and hand-knotted collection is quite simply stunning. The designs are timeless and will blend with modern or traditional decors. Over 200,000 knots per square metre and handmade from the finest, hand-spun yarn in Nepal. Ancient Persian hand-weaving techniques passed down from generation to generation give this collection a traditional Tibetan appearance. Only the finest New Zealand wool blended with Tibetan highland wool is used in the hand-knotting process. 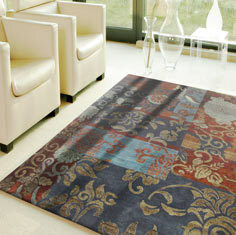 Lombard rugs are produced in 9 different sizes including large room-sizes. Bespoke sizes as well as customized sizes and shapes are available within 16 to 20 weeks.